The U.S. 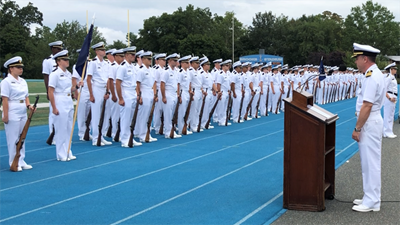 Merchant Marine Academy (USMMA) at Kings Point welcomed the Class of 2022 into the U.S. Navy Reserve Saturday in a parade and ceremony at Tomb Field on the Academy grounds. The Class was sworn in on behalf of the U.S. Navy by Capt. Steven Urwiller, USMMA ‘94, the Director of Military Sealift Command’s Reserve Affairs and Military Manpower. The parade and ceremony marked the end of formal activities for Parents Weekend 2018, with eligible Plebes and Midshipmen heading off the Academy for liberty. This is especially important to the Class of 2022 because it is the first time they have been allowed to depart the Academy since their arrival at indoctrination training on June 29. The swearing in represents another step for the Class in their journey toward becoming leaders and licensed U.S. Merchant Marine officers. Before administering the oath, Urwiller encouraged the Plebe class, telling them they are joining at a time when their presence is most important to our country. He congratulated them on their progress thus far before administering the oath of a Midshipman in the U.S. Navy Reserve. Once sworn-in, the Plebes joined the Regiment of Midshipmen and marched past the reviewing officers, Rear Adm. James A. Helis, Superintendent of the Academy, Capt. Urwiller, and Cdr. Andrew McCarthy, Deputy Commandant of Cadets. USMMA is the only federal service academy where graduates earn three graduation credentials – a Bachelor of Science Degree, an Officer’s commission in any branch of the military, and a U.S. Coast Guard (USCG) license as a Deck or Engineering Officer. As part of their service obligation, graduates of USMMA serve five years on active-duty in the military, or sail five years as Officers in the U. S. Merchant Marine and eight years in the Reserves. USMMA is the single largest commissioning source for the U.S. Navy after the Naval Academy, ensuring a steady stream of leaders and merchant marine officers to support the nation’s economic and security interests.